High channel count DMX LED dimmer packs for sale! Two commercial spinoffs of client projects. Every unit is tested and supported by the engineer who designed it. Ask me questions about your application! ATTENTION: as of march 2016 I can only sell to existing customers due to lack of time for customer support. Thanks for your understanding. 32 channels @ 8 amps DMX LED dimmer pack: this board controls 32 LED clusters/strips (or anything DC powered) of up to 48V @ 8 Amps each. Beefy! (Discontinued) 48 channels @ 20 to 80mA DMX LED dimmer pack: this board controls 48 LEDs (single LEDs or several in series) at 20 to 80mA each, with no current-limiting resistor needed. A newly renovated nightclub in the UK has a 10,000 RGB LED installation that was built entirely with electronics I custom designed! 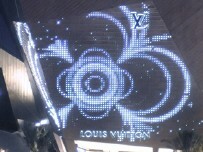 Louis Vuitton CityCenter at the Crystals, Las Vegas: 4000 LED façade, custom designed electronics. News flash! Winner of the Paul Waterbury award for outdoor lighting design for 2010!